Detailed press information about our company and each of our hotels. Styled after the sprawling palaces of the Minoan kings and Venetian nobles who once ruled Crete, Amirandes has the easy elegance of true European Luxury. 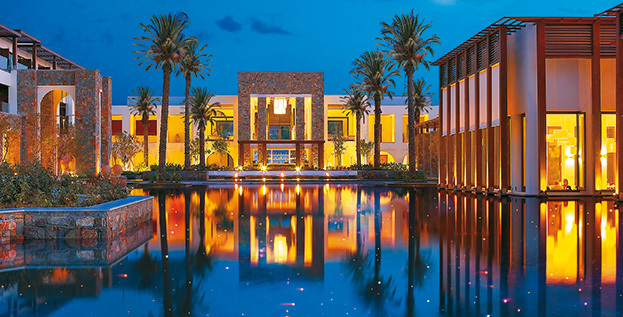 The Cretan elements of water, fire and earth are the hallmarks of this sophisticated beachfront resort with the highest standards of Mediterranean luxury and refinement. A world of style and Cretan warmth, where the tranquil lagoon waters meet the sea. Luxuriate in the sheer abundance of choice. Guests are pampered by the range of spacious, quality accommodation. Indulge in supreme and refined ambience, where soft colours and cool fabrics create a leisurely mood. An ideal environment to work out in the privacy of the en-suite gym and cool off by your controlled temperature private pool or at the tropical rain shower al fresco. 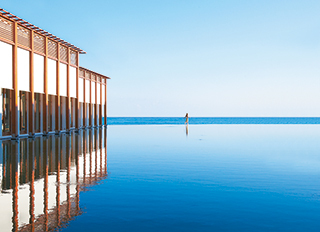 Architects’ sleek lines set off the celebrated beauty of the southern Mediterranean landscape and teal waters. Natural stone terraces with sea views stretching forever are perfect for tranquil days and flirtatious nights. Personal service and in villa private dining compliment this elite resort’s relaxing ambience. Celebrate special moments and revel in absolute luxury. Choose an apartment-sized beachfront property with a unique master bedroom and endless indoor and outdoor living space. Stylishly cool environment equipped with the latest state-of-the-art audiovisual entertainment units. A palette of colours and style, exhilaration and serenity, all ensuring blissful harmony. Just set the colour to your mood! Endless blue by the swimming pool, the exotic lagoons and the infinite sea. Enjoy quality family time together splashing around on the beach or in your private pool and revitalise with Ayurveda treatments from Indian therapists at the exclusive Elixir Alchemy Spa. Whether we are organising your dream party, wedding, special event or a business conference, pampering our guests is our favourite service! All you have to do is decide: private or public, in your villa or on the beach.